Once again, this is John. A little while back, I discussed sourdough starter, mostly in the context of bread. But, you can use sourdough as a leavener in just about anything. Admittedly, I don't know enough about all the chemistry and mechanics involved in baking to come up with my own sourdough versions of things. Fortunately, I don't have to. There are plenty of people out there who have already attempted, and perfected, just about every sourdough application you can think of. 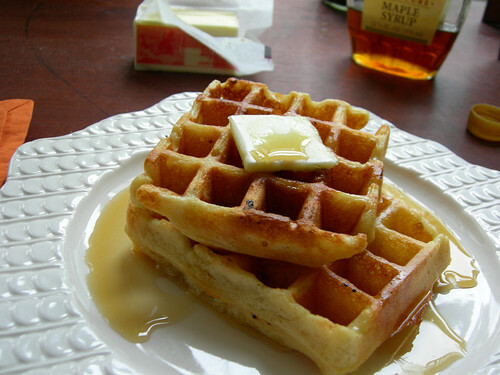 When I Googled "sourdough waffles" some time back, this was the first result. I've made the recipe a few times, and it makes the best waffles I've ever tasted. I've made a few very minor changes to suit my own tastes. I use slightly more baking soda than the original recipe calls for, as I've found that it gives them a much lighter texture, and I use a slightly different technique to incorporate the butter and milk. I also add some freshly-grated nutmeg. I perfer them this way, but only by a very slim margin. If you follow the original recipe to the letter, as I did the first few times I made them, you'll still get excellent results. That said, the recipe I post here will include my modifications. In the microwave, melt the butter in a measuring cup, or some other microwave-safe container with a pouring spout. Pour the milk into a small mixing bowl, and then pour the melted butter into the milk. Whisk to combine, and set aside to cool. Meanwhile, in a large mixing bowl, combine all of the other ingredients (flour, starter, sugar, salt, cinnamon, nutmeg, vanilla). Pour the milk/butter mixture into the batter, and stir until combined. Cover the bowl with plastic wrap, and allow it to sit overnight. 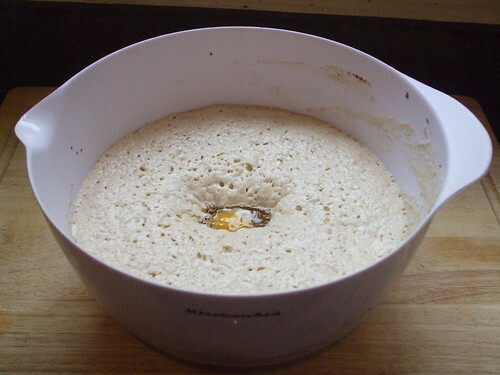 After sitting overnight, the batter should be very bubbly, and about doubled in size. Whisk in the eggs and baking soda until combined. Prepare according to your waffle maker's instructions. This recipe makes about 10 waffles on our waffle maker. These waffles are crispy, light, and just slightly tangy, which is complemented nicely with a little bit of maple syrup. Beware the Ides of March: birthdays, burgers, and cake- oh my!